A modern looking score in 2018? Have your scores reviewed by other users. Comment on old and new published scores and on publishers. Re: A modern looking score in 2018? At the risk of sounding like an appeal to authority, I am a professional singer who sight-reads several brand-new scores every week for a living, so I don't consider my opinion entirely uneducated on the matter. I would have more difficulty using a score that adheres to your standards than to what you call "baroque notation", and ultimately that's what it comes down to. I don't think that's something that can be pinned down as subjective, considering the numerous studies on serif legibility, especially at low font sizes. But, as you have wished, I will rest this particular matter. All I will say further is: if what you say about readability is correct, then why do publishers like Schott, Carus, Universal Edition, and so on who build their "brand" around the visual design language you champion (Carus, especially) and extensively use sans-serif fonts everywhere else, resort to serif fonts in music? So I did a little experimenting, trying to come up with a sans serif music font and testing whether it looked more "contemporary". Easier said than done. First thing I noticed is that there are different classes of music symbols that react differently to the attempt of making a sans serif version of it. (1) and, of course, time signatures: They are easily turned into sans serifs, just draw a basic skeleton of the symbol and apply a constant stroke width, come up with a solution for the ball terminals, done! You may not like my version presented below (that is totally understandable, I don't really like it either), but in principle it is pretty straight forward. (2) : I tried to come up with a version that reduced the difference in stroke width between horizontal and vertical lines – and failed. I is either harder to read or too prominent on the page. So all I did was to draw a "clean" version of the traditional symbols, which looks pretty much the same on the page. (4) Flags: Weirdly, in my own music font they are already "sans serif", there is not much difference in stroke width. Again, I cleaned up the symbols slightly, but it's hardly noticeable. In order to test the result I used one of the "Five Little Pieces" for piano by Peter Maxwell Davies. 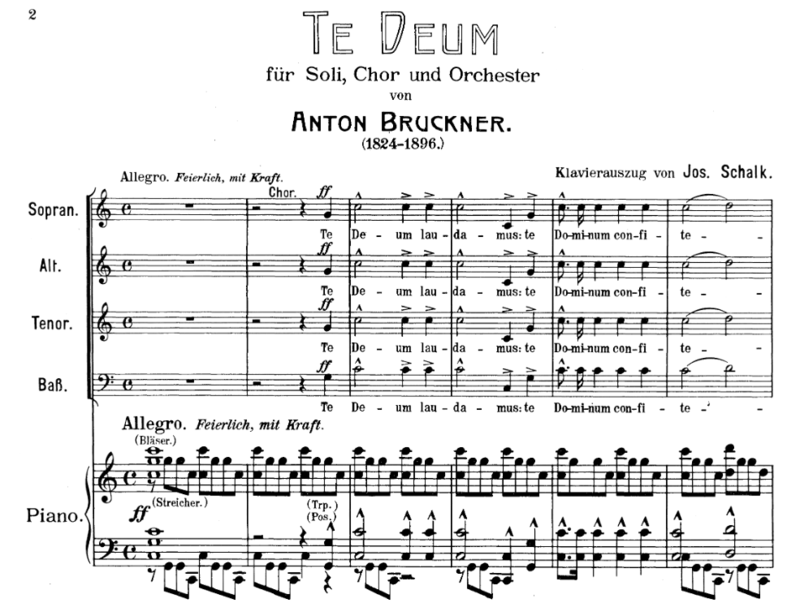 The first example shows "old style" engraving (my own music font based on Peters editions, Hercules for text elements). All engraving choices are taken from my Boosey & Hawkes edition. The second example uses the same music font, but Thesis Sans for title etc. and also for dynamic and tempo markings. The page does have a different feel to it. Whether this is accurately described as "more contemporary" is another question. But it looks different, even though the music font is the same. The third example uses the sans serif music font described above (in addition to the Thesis Sans text font). To me, it doesn't feel much different from the second example, certainly not more or less "contemporary". I looks like a slightly weird version of traditional engraving. From this little experiment I conclude that, as long as you want to keep your music font readable (and therefore close to traditional engraving), it is hard to come up with a sans serif music font that has an influence on the overall feel of the printed page. The choice of TEXT FONT seems to have a much greater impact in that regard. So to create a more "contemporary" score one shouldn't focus too much on the music symbols and more on the overall design of the page and the use of text within a score. 1) It is used very sparingly and does not replace any of the "iconic" music symbols that our eyes naturally recognize. 3) UE have showed their engraving brilliance once more by harmonizing the sans-serif font with their other (quite modern, actually) music and text fonts so that it does not draw undue attention to itself. I feel the examples previously posted stand out too much in relation to the music. @liuscorne: if I haven't said it before, your Peters music font is beautiful and quite balanced. I would admit the use of sans-serif for the composer & poet information, and the title, but I have the same misgiving about using it to replace the dynamics and tempo indications that I did before. I apologize for joining the thread so late, but it's a very interesting one. I would just like to show one example of what the Polish PWM did at the end of the 'modernist era' in 1982, one page from Ligeti's Grave : Metamorphoses for Violoncello and String Orchestra. This is by no means the most 'modernistic' score, and maybe not the best example, to be found from this period, but in its kind rather typical for an engraving attempting to look more modern than the 19th-century ones. I wouldn't do exactly this myself as an engraver, but instead of being offended by its lack of baroque elegance, I'm rather charmed by it. Ligeti is one of the greatest composers of the last century, and I think it's not without interest to know the atmosphere of the time when he was active, an atmosphere well conveyed by this rather crude engraving. Finale 25 on Windows 7 and Mac OS 11.6.